Sioned Pearce and Stuart Fox consider the role of young people in Wales in the European referendum. We know young people are less likely than any other age group to vote in any form of democratic participation the UK (and across most of Western Europe), with the exception of the Scottish independence referendum in September 2014. In Scotland more young people than ever are registered to vote following a surge in turnout of 16 to 24 year olds widely attributed to ‘the referendum effect’. Here voting on a single issue, in this case whether to remain or leave the UK in the context of devolution, led to an increase in the turnout of young people. What we don’t know is whether this ‘effect’ will apply to the EU referendum. Looking specifically at Wales we ask whether young people will turn out to vote on the 23rd of June. The youth vote has been on the agenda in Welsh politics for some time and since the St David’s Day Agreement there has been the potential to transfer power to extend the voting franchise from central Government to the National Assembly for Wales. In recent years organisations like Youth Cymru (and Llais Ifanc), the Electoral Reform Society and the National Assembly’s Youth Engagement team have been working tirelessly to engage young people in politics and the political outcome of the elections. In terms of likely voting behaviour, the EU referendum, population level predictions show that while Scotland sits firmly in the Europhile camp with 57% for Remain and Northern Ireland not far behind at 56%, the Welsh population’s support is less certain with 41% for Remain. Despite this, a poll released last month revealed the most ‘Eurosceptic’ and ‘Europhile’ areas of the UK, with the highest support for Remain in Ceredigion, the home of Aberystwyth University. This is in-line with findings which suggest higher support for the EU within University towns where more young people live and study. So do these patterns change when applied to young people in Wales as a whole? 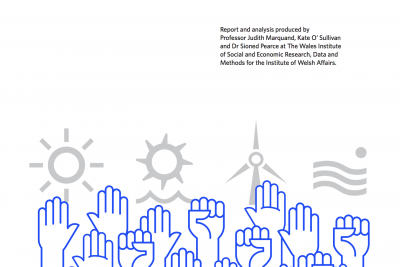 The Wales Institute for Social and Economic Research Data and Methods’ (WISERD) have conducted a study of the EU referendum with under 30s in the UK. Results show not only are young people in the UK more likely to support the Remain campaign but young Remain supporters are also more likely to turnout to vote. However, when applying this pattern regionally young people in Wales are the fourth most likely to vote Remain (66%) after the South West of England (72%), Scotland (72%) and the North West (67%). In terms of generational differences while a decent proportion of young people in London wish to Remain, Wales comes higher depicting a young Welsh generation more supportive of the EU than those in the Capital. To consolidate this only 20% of young people in Wales support the Leave campaign coming 7th out of 11 regions ranked from high to low in terms of support for Leave. In terms of young people sitting on the fence Wales has relatively few ‘don’t knows’, 13% compared with a high of 22% in Yorkshire and Humber. Young people most likely to turnout to vote are based in Scotland (66%), the South West (59%), the East Midlands (57%) then, in fourth place again, Wales (54%). In terms of both Remain support and turnout Wales is in the top half but consistently coming behind Scotland. Given the relatively low number of ‘don’t knows’ and the relatively high predicted turnout, young people living in Wales present a fairly strong concentration of support for the EU and are relatively likely to back that up with a vote compared with other regions of the UK. Despite this, the ‘referendum effect’ is unlikely to take the same form in Wales as it did in Scotland in September 2014. However, findings from research by Dr Stuart Fox show current affairs, events and announcements in the media can have a strong effect on EU support among young people. In light of this, campaigning for and the results of the devolved elections in May 2016, including those from Scotland, have the potential to change opinions. One issue to consider is the recent increase in UKIP support in Wales, now holding 17% (+2) of constituency votes and 16% (+2) of regional votes according to Professor Roger Scully’s most recent Elections in Wales survey findings. The impact of devolved election outcomes and other unforeseen events could well have an impact on the current swing in favour of remaining within the EU among Wales’ youth. The current behaviour of some European Union Countries ignoring the abusive attitude to women, of some would be immigrants on the grounds of ” Not wanting to offend those brought up in a different political culture” is totally unacceptable. Definitely cause to vote NO. What ever one’s age. The recent frost killed off a load of my vegetable seedlings and this evening the weather forecast said there was another cold front moving in over the weekend. High time we ditched this useless Euroexperiment. Definitely cause to vote NO what ever seedlings one’s planting.